I do not drink tea as often as I would like, because it’s hard on my insides. You wouldn’t know it to hear me rhapsodize about food and beverages, but I have a long history of gastric woes. Perhaps that is why I prize food and drink so much. Some pleasures are sweeter when you can only enjoy them once in a while. America is known as a land where you cannot get a good cup of tea, and for the most part, that is true. Even in fine restaurants, ordering tea results in a pot of warm water and a choice of tea bags from a rosewood box. 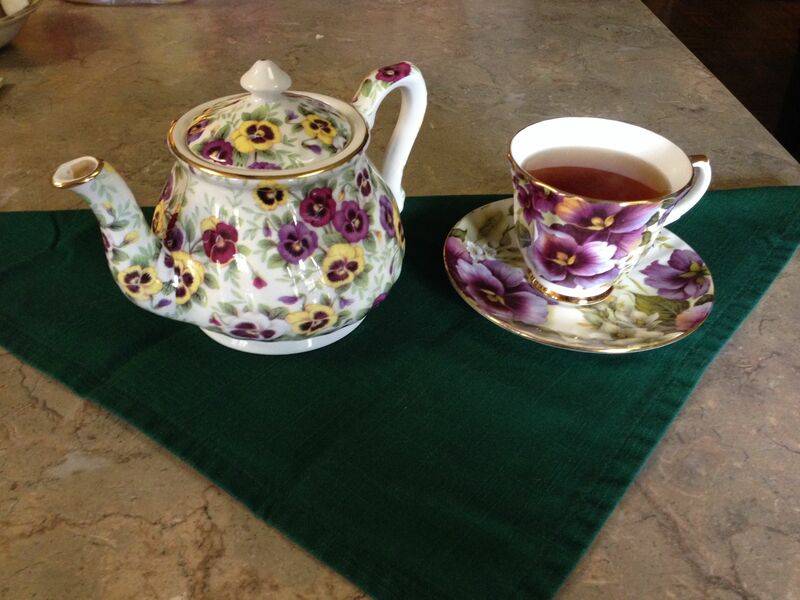 You’re lucky if a good, plain black tea is included in the selection of fancy herbal and flavored varieties. The good stuff. You can almost smell it, can’t you? I may as well confess here and now that I am devoted to plain black or green tea. Nothing flavored. Once in a while, if I can’t drink real tea, I’ll have chamomile or another herbal tea. During the holidays, I will drink chai. But I cannot abide bergamot. No Earl Grey for me! I am secretly convinced that “Earl Grey” owes its popularity to its aristocratic name, not its flavor. Apologies to all you Patrick Stewart fans. My favorite pot and cup. They don’t quite match. The Long-Suffering Husband and I learned to drink tea from a guru. He was known as The Tea Man. 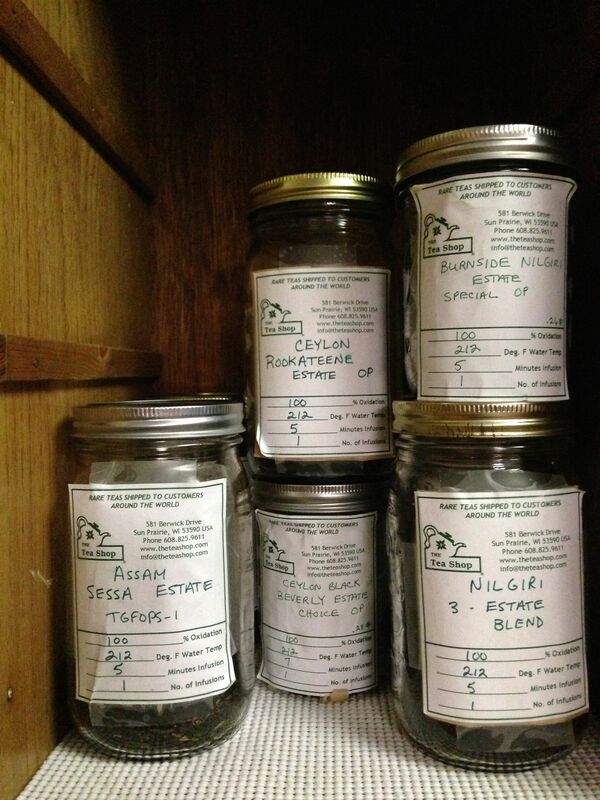 His shop on Williamson Street in Madison WI was lined with shelves of jars, each holding a different leaf or blend. There were teapots and the odd bit of crockery, but nothing flowery. It was a decidedly masculine space. When you visited the shop, you did not simply walk in and order something. Before business was conducted, tea was to be sampled and discussed. He would offer some Nilgiri that had just arrived, or something he thought you would enjoy, based on your past purchases. The Tea Man taught us to make tea in a pot. Two pots, as a matter of fact. One for brewing. The brewing must always be timed, between two and four minutes, depending on one’s taste. The tea was to be poured through a strainer into a second pot, suitably warmed beforehand with hot water. Tea bags, he explained, contained the sweepings from the factory floor. 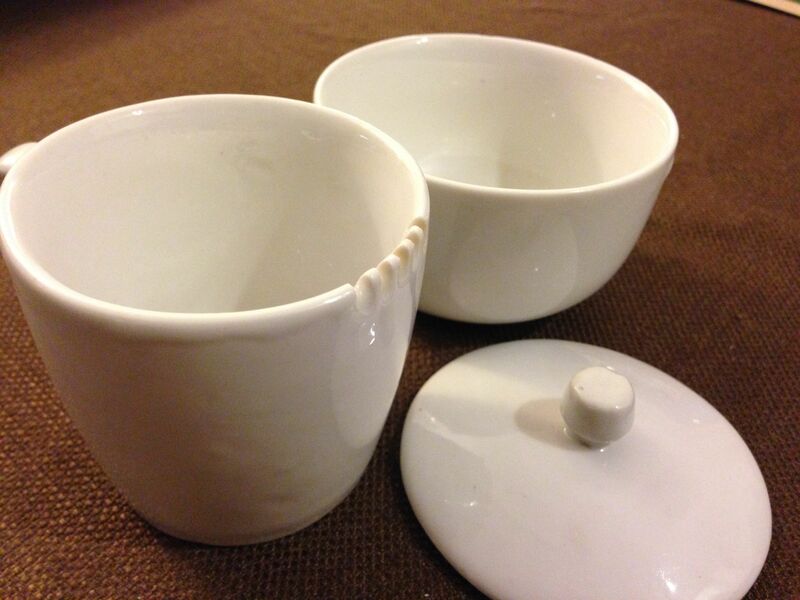 One of the Tea Man’s personal cupping sets. This was used to taste tea on his buying trips. With all the good teas one can find in bags today, I’m sure that’s no longer the case. And yet, truly fine tea simply does not come in a bag. Period. For daily use, one’s preferred tea in a bag is fine (with boiling hot water). But for something special, there is nothing like real leaf tea. Tea that is innocent of any factory, of marketing and packaging and puffery. A treasure house of teas. The Tea Man was not averse to flavored teas. He blended his own. One of his best-selling teas was a chai-like “spice tea” with licorice root. It made the tea taste remarkably sweet, even though it contained no sugar. The Tea Shop storefront is gone now. The Tea Man passed away in 2001, but his family carried on the business, which has a website where you can buy premium teas from China and India as well as his personal blends: Spice Tea, Rose Garden (with rose oil) and yes, Earl Grey with Double Bergamot. From The Tea Shop website as it looks today. Click to visit it. The Tea Man was indeed a Beautiful Man. Thanks, Reed, for teaching us that “excellence is not optional,” and that there is always time for a good cup of tea. I love tea! Including Earl Grey. AND Lady Grey. Ick. I cannot imagine drinking that double bergamot tea! Lady Grey is a bit more tolerable. I don’t mind the flavor of orange peel. Loved reading this. Ireland has one if the highest per capita consumptions of tea in the world. Unfortunately it seems to be all quantity and no quality as the Irish prefer mass produced tea bags to loose tea. I confess, I often go for the quick cuppa, too, but my favourite tea is my own blend of (any) black leaves with a spoonful of Vanilla tea. No sugar, but a good dash of milk. Even better: a spoonful of cream, like they traditionally drink tea in North-Western Germany. Yes, the Irish tea consumption is legendary! Mr. H. is known to be fond of Barry’s tea from Cork (in bags). I never take sugar, but honey is nice if one has a cold. I also like milk or cream. My favorite thing lately is Silk brand coconut milk. It’s also divine in coffee! I grew up observing watching my family drink tea from a glass, with milk or cream, and a lump of sugar under the tongue. For me, tea ( Lipton or Tetley) was something I had to drink when I was ill. Today, I can drink tea ( lapsang souchong, Earl Grey or English Breakfast) as long as there’s milk in it – but my favorite tea has become genmaicha, a green tea roasted with brown rice to give it a more rounded, and less bitter flavor. Yes, I like genmaicha too. It has a wonderful toasty flavor. 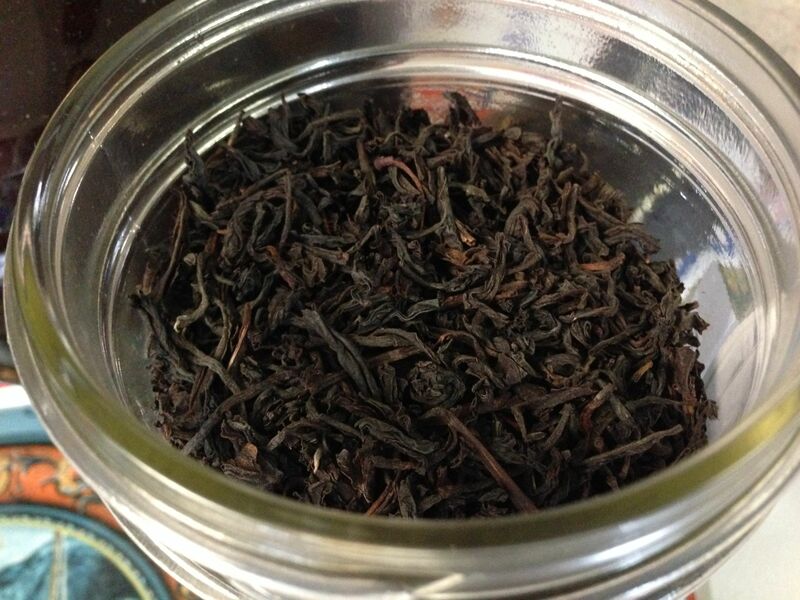 And lapsang souchong has that smokiness, like peat. I don’t know whether it comes from the soil it’s grown in, or some aspect of the processing, but it’s good. When I was growing up in the South, we always used Lipton or Tetley to make iced tea. The easiest way was “sun tea,” just putting a big jar of water out in the sun with teabags in it, then adding ice once it was done brewing! Although I’m quite a tea taker (drinker? I follow literally Sting’s song I don’t drink coffee I take tea my dear) I must confess that I always use the bags. I must start using the leaves. Earl Grey without sugar nor milk in the afternoon, with both of them at breakfast. Wow, that must set you apart in Rome! You don’t have your espresso in the morning, midday and evening? ‘I don’t think I’ll ever see, a poem as beautiful as a cup of tea.’ This was a wee poem that I once cut out of the newspaper and stuck to my fridge. 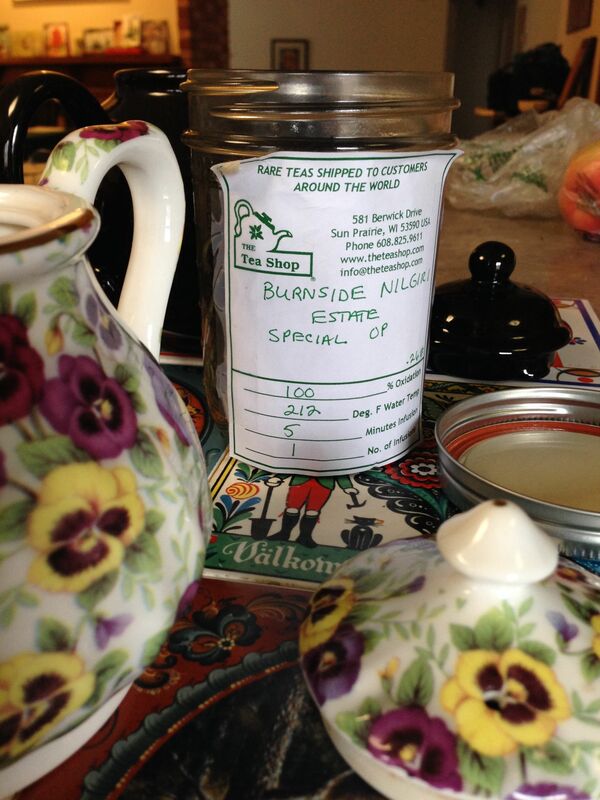 This post is a lovely ode to tea and your Tea Man. I do confess to using teabags on an everyday basis, only Yorkshire Tea or Twinings Irish or English Breakfast. But nothing beats real tea leaves in a pot, be it black tea with a dash of milk, green tea or herbal tea. (Not flavoured black tea…and never Earl Grey due to overdosing on it in my early twenties, shudder.) I love your teapot and cup. Thanks Cheer. A cup of tea is indeed a poem; the Tea Man would approve! I am “brewing” up a post about green tea, though it’s quite a subject to tackle. It deserves some well-chosen words. As to tea bags, I like Twinings (esp. the Irish) but I’ve not tried Yorkshire. Thank you for writing about The Tea Man! Decades on I still remember going to his shop on Willy Street and listening to him talk about tea. You captured the experience perfectly.